Ella is the fashion designer and founder of Australian womens street wear label DREAMMONSTAR. I had met Ella a couple of years back and was an admirer of her brand. I was instantly intrigued by her collection when I first came across the label at a Neverland store. Dream Monstar is not only designed but created right here in Australia. Her brand is stylish and fashion forward; Dream Monstar is well-known for their muscle tops, street luxe style and neoprene swimwear collections. Her playful and statement designs would complete any savvy fashionistas wardrobe. Ella is now not only simply sold in Australia, but has succeeded to stock her brand in America. Such as online NASTY GAL and Kourtney Kardashian store - DASH boutique just to name a few. Ella how did you get into fashion tell us your story. I have always been obsessed with everything design – from fashion to print media, art and architecture. I’ve subscribed to Vogue, Harpers and ELLE USA since I was young and would pour over the pages for hours. I still have all issues archived at home.. I started designing swimwear before I worked on Dream Monstar. 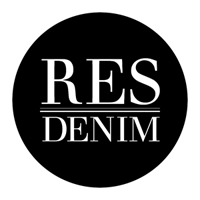 My husband designs / owns a number of menswear labels and when we met I realised it was the perfect time to start my dream and create my own label. Dream Monstar was born. What is your label about? How many years did it take for your brand to make the scene? Dream Monstar is started as a street wear label for every girl, the ‘dream’ girl who likes more feminine pieces and the ‘monstar’ girl who’s a little edgier. I was really lucky and launched Dream Monstar as social media was making waves. The label’s social media profile grew fast and with that the brand awareness was strengthened. We then showed at the trade shows in the US, found an LA showroom and sold to Nasty Gal, Dolls Kill and the Kardashian’s DASH stores across the US. You create day/sleepwear, swimwear and candles tells us a little bit about the progress of each when sourcing to selecting your materials to achieve the final product? For our fashion and swimwear collections I am inspired by travel, editorial shoots, blogs, fashion sites and runway collections. It’s a long process from sourcing inspiration to receiving samples, shooting our look book and then retailing our product. Each season is completely different, that’s what keeps things fresh. Honestly – the whole process. Sourcing inspiration online is totally addictive, planning and shooting look books and campaigns is also extremely creatively fulfilling. Taking a garment from an idea t hrough to a finished product is such a rewarding feeling. I live for travel – it truly ensures constant evolution and a fresh approach to the process. On an international level, I am always inspired by Karl Lagerfeld / Chanel, Olivier Rousteing and his Balmain collections, also labels Emilio Pucci, Saint Laurent and Isabel Marant. Also the glamour of the 70s and the history of LA life. What gives you inspiration for each collection you create, do you go on fashion trips to gain inspiration? Inspiration can come from many mediums – from a print created in a landscape to interior styling and runway collections. For our collections we undertake intensive research online and also go on vacation for true inspiration. I love getting over to the US for inspiration – almost every aspect of our trips there bring inspiration. Our stockists in the US are pretty damn cool – we loved seeing Dream Monstar on Nasty Gal and also on Kourtney and Khloe Kardashian. Particularly knowing they had chosen to wear our label, we don’t pay people to wear our pieces. It can definitely be a really difficult industry to succeed in, need to have a creative eye, fresh concepts, financial backing and a super strong work ethic and determination to make it. Never give up and remember, everything happens for a reason. Having handcrafted all her collection to shimmer perfection. Courtenay’s hard work shows in all her ultimate statement pieces. I sat down with Courtenay for our interview inside a café, below where her studio is situated. I was lucky enough to get a sneak peek upstairs. I must say it’s very enchanting to see the full range out in display I was mesmerised by the handbags, a truly beautiful collection. From lined up bags to cabineted glitzy sparkly shoes she had hand embellished herself. I attended RMIT’s, Bachelor Of Design (Fashion) course, I graduated in 2008 with first class honours. I was awarded Most Promising Student in 2007, which was judged by Karen Rieschieck, owner of Alice Euphemia which was a little boutique in the Nicholson building which housed independent Australian designers. After the completion of my course I moved overseas to Stockholm, Sweden. I interned for 6 months with local designers Fifth Avenue Shoe Repair. It was a small boutique fashion company where i got to work in all area's of the business. The designers there was really creative and inspiring, it was great to work alongside her. What was it like to intern overseas? I always knew when I graduated I wanted to go to Europe. My internship was for six months. It was a fantastic experience, because it was a really small team of seven people, so it was very hands on. After my internship I then started working for a much bigger company, which gave me a different skill set and valuable knowledge into the high street market. I’ve always wanted to have my own design studio but before I could start on my own label, I wanted to gain some experience in the industry. After working within a small and super creative boutique design firm, I then worked at a much larger and more commercial fashion company, so I felt quite confident in being able to start my own label. My studio overlooks a gallery space which is such a nice place to arrive to every morning. Basically at the moment I hand make all the pieces so that takes up most of my time. My usual day is centred around sewing, cutting out fabric pieces, applying all the hardware different gold hard wear plates installing them. Answering emails and getting in touch with people, being present online and in social media. Currently its just myself, however I have some really special and amazing people who have donated some of their time to helping me out at this early stage. Also I have worked really closely with Niika who are an amazing digital agency and managed to create an incredible website and online store which reflects the MAUDE Studio style. How did you learn to create and make your handbags? I taught myself how to make them. I learnt at Fifth Avenue Shoe Repair that you can make anything you want however you want, there are no rules. Coming from a womenswear background, I approached handbags the same way you would a garment. However it was a long process of trial and error to make the bags perfect, as the they need to be practical, functional, long-lasting and durable-as well as pretty and fun! It just depends, I try to find my fabrics locally but unfortunately that is difficult. Often I can’t find what I need so I have sourced some of my fabrics though an overseas wholesaler, but where I can I will buy fabrics locally. I use synthetic fabrics different variations of PU and PVC, as well as Polyester. I’m vegetarian so I prefer not to work with leather, and there are some really amazing synthetic fabrics available. All items are handmade locally in Melbourne by hand. Experience and hard work. Having worked for a small design label helped me learn how to run things in my own small business. In addition to this, working for a larger company helped gain an understanding from a really structured business perspective. I have also just completed a Certificate 4 in Small Business so that was really useful and relevant. My first collection Blue Planet (2012) was very much inspire by David Attenborough’s documentary titled “The Blue Planet” I’ve always been fascinated by sea creatures and in this collection you can see it is very much present. It was a five piece woman’s wear capsule collection featuring delicate pleating and flounces to emulate underwater creatures. Glittermare (2013) was a mixture of shoes and clutches embellished with brightness and sparkles and spikes. I managed to source a whole heap of sample jewellery at the time and I came up with the idea to use all of those to regenerate something existing to make a new and exciting creation. I wanted to make pieces which were really over the top bling, crazy cool it was a scary fun look that I developed and applied onto clutches and shoes. I love the photos of this collection its one of my favourite shoots. The Candy Collection (2014) I knew I wanted to explore handbag design and so I decided to start to develop and focus on that. 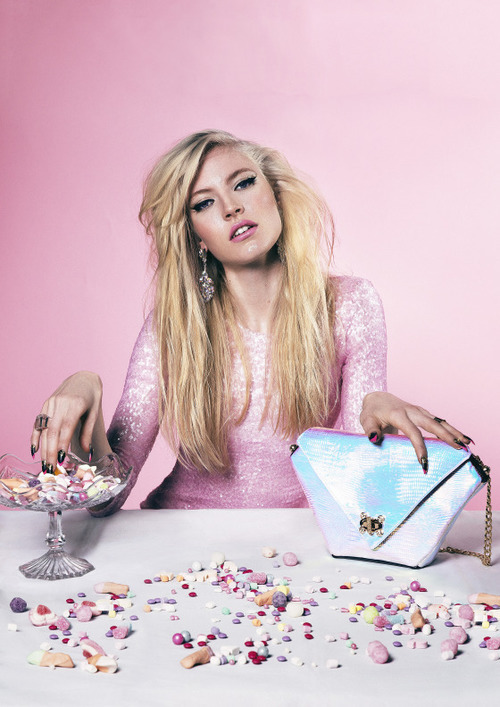 The Candy Collection is a 5 piece ensemble of bright and shimmery embellished handbags reflective of all things sugary sweet and artificial. It is currently available to purchase via the online store. I wanted to represent the feeling of being in a candy store but also make something beautiful and unique at the same time. Working for myself is great, I have so much creative freedom. Previously I had worked for a really big company so now working for myself I can explore different ideas and concepts that inspire and drive me as a designer. Being able to do what you love and what interests you then finding a customer who appreciates that is very rewarding. What’s your advice on networking to all our emerging designers and students? Be outgoing and introduce yourself, be interested in what other people are doing. Follow people up people and if your very genuine about yourself and what you love people will recognise that and be interested in helping you out. Also, be nice it’s free and you never know where it will lead you. Getting my brand off the ground. Everything has come together really well and I’m really happy with the brand identity and the collection. I feel really proud of the online store and fortunate to have been able to work with Niika who have done such an amazing job with my website and online store. I’ve also had great people help me through the process supporting me at different stages with different things. The concept has been bubbling ever since I was a fashion student. But so far its been eight months and the online store launched a couple of weeks ago. Who are your inspiration/ fashion designers who you look up to? Lots of people as well lots of different things! I do have a huge appreciation for Manish Arora he is amazing. What he does is what I dream about doing, he’s really into embellishments and delicate designs, which I admire and love.